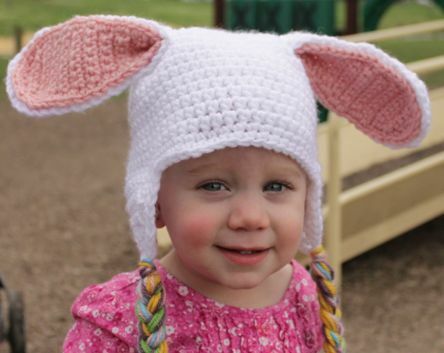 It is just two weeks until Easter, and we simply can’t let a holiday pass by without making a variation of my free Versatile Earflap Hat Pattern – a bunny, of course! 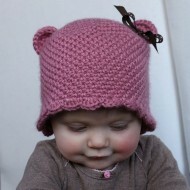 This hat would be such a cute photo prop and fun addition to your holiday events. 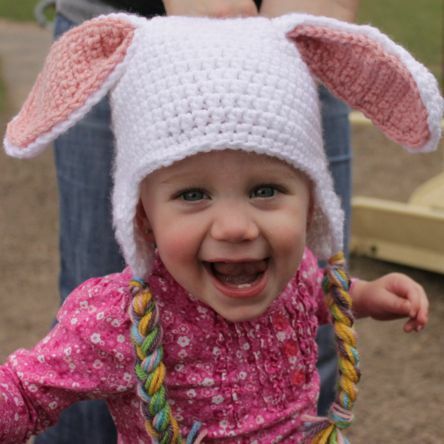 I know this little cutie liked it so much she wanted to wear her bunny hat the entire time we played on the playground. 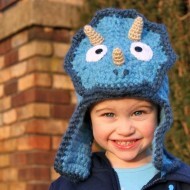 You can find the basic instructions for the hat here. I made my hat completely in white. Then follow the directions below to make the ears. Attach same color yarn in same st as first chain. Ch 1, work (sc, ch 1, sc) in corner, sc across to other corner, work (sc, ch 1, sc), sc evenly around the remainder or the ear and join with a sl st in the first sc; fasten off, leaving a long tail for sewing. Attach same color yarn in same st as first chain. Ch 1, work (sc, ch 1, sc) in corner, sc across to other corner, work (sc, ch 1, sc), sc evenly around the remainder or the ear and join with a sl st in the first sc; fasten off and weave in loose end. When you have all of you ear pieces made, line up the straight sides of one outer ear and one inner ear and place them wrong sides together (wrong side will be the back of your final round). Using the long tail from your outer ear, sew the two pieces together just through the backs of the stitches all the way around. Pinch the ear in half at the bottom across the straight edge. Sew along the edge to hold it in place and then sew the ear to the hat. Repeat with the other pieces. Lastly, I finished my hat off with braids of pastel colors on the earflaps. Thank you so much for the very cute bunny hat pattern!!!! I love your versatile hat pattern-really works well!!!! So glad you are enjoying it, Cheryle! Thanks!! 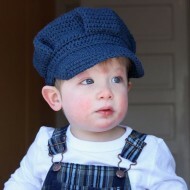 Micah, A very cute easter hat, I’d like to try lots of easter colors with this hat. Thank you, your crochet is very creative,fun and you’re good at it. Thanks, Joan! I would love to see if you get a chance to try lots of easter colors!! Thank you for the pattern! I can’t wait for my little one to arrive in november to wear this! !